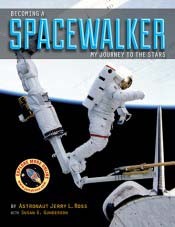 This nonfiction picture book is a children’s version of NASA astronaut Jerry L. Ross’s autobiography, Spacewalker: My Journey in Space and Faith as NASA’s Record-Setting Frequent Flyer, designed for ages 7–12. Told in friendly first-person narration, it represents how Ross followed his dream from rural 1950s northern Indiana to Purdue University and then outer space. The thirty-two-page book is illustrated with personal photos and memorabilia. It is formatted into twenty-three narratives organized in chronological order illustrating events and experiences in Ross’s life. Pages attractively interweave photos and text while prompts encourage readers to engage in in the story.